My team and I sourced many ideas from Pinterest for our Superhero VBS. This begins a series of posts where I will share detailed information about our experience. When we follow God, He can do amazing things in us and through us. Our small church had a very limited budget for VBS. Many of our ideas came from Pinterest. We met for three nights, 6:30-8:15 p.m.
Each night, the entire group assembled for about 20 minutes for an Opening, where we taught the Bible story. Children were then divided into three groups by age. The rest of the evening, they rotated through Crafts, Recreation, and Mad Science. (About 20-25 minutes in each station.) During the last 15 minutes, we gathered in the fellowship hall, where kids ate a snack and the emcee chatted with them about key concepts from the evening. Using cardboard boxes and black spray paint, we created a backdrop to look like a big city skyline similar to the one pictured above. We then ordered superhero wall decals from Amazon.com and attached them to our cityscape. I downloaded several cool, comic book-type fonts from dafont.com. Badaboom BB, Comic Book Fun, Fighting Spirit TBS, and the whole series of SF Comic Script fonts were so much fun to play with! The children were separated into groups according to age. We bought blank name tags and printed comic book speech bubbles in the corners. (“Bam!” “Pow!” “Zap!”) Each group wore the same speech bubble. Each group also had its own name: Tremendous Transformations, Magnificent Miracles, and Dynamic Disciples. In my next post, I will share my emcee scripts for each evening’s Opening. I would love to have your emcee scripts and more specific notes 🙂 We are going to try the same theme in July. Thanks! I will be working more on this series over the next few weeks. Thanks for reading. Do you have scripts for each lesson. Would love to use for our vbs. We also have a small group. I would love to have them too. 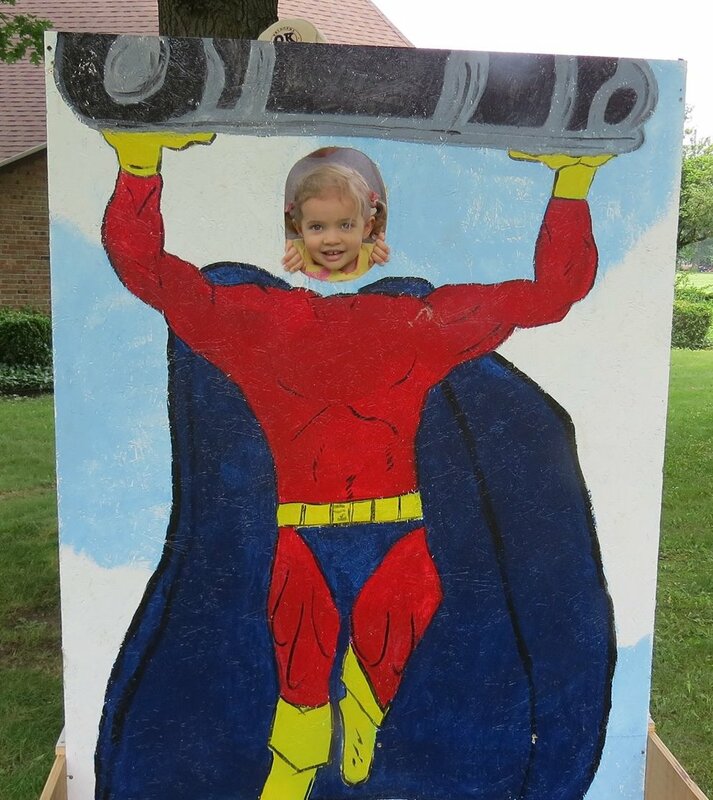 I am trying to put a Superhero VBS together for a small church in a few weeks who doesn’t have much of a budget. Thanks! I would the scripts and details also! Do you happen to have the rest of the scripts and details? I would love to do this VBS for our church this summer! Thanks! I would love to read the other scripts as well! We are doing Superheroes this summer! Thanks so much for sharing so many great ideas! Our church is planning on doing Superheroes for VBS this summer too. Could you pass on the other scripts as well?